Quantum Dot vs OLED, which is the better display? OLED technology may not be new any more, but it has recently seen a big up-tick in momentum. Panel manufacturers are investing large sums of money into new production lines and market researchers are predicting a huge growth in revenue over the next few years. OLED displays may well replace the traditional LCD as the go to panel in the future, but it is facing competition from new display technologies too. Quantum Dot panels are seen as particularly promising, so let’s take a look at the differences with OLED and if it has what it takes to produce superior quality displays. First up, let’s quickly recap the major differences between the ways that the technologies work. OLED, as the name suggests, is built from an array of tiny light emitting diodes (LEDs) each of which produces a color of light on demand, unlike LCD which requires a backlight. These LED’s are constructed from organic material layers and use phosphorescent color layers to produce different colored lights. Tweaking the make-up of these layers can result in displays with different efficiencies and qualities. Quantum Dot (QD) displays are quite different as the technology is based on small conducting nanocrystals, usually in the range of 2 to 10 nanometers in diameter. The color of light produced or filtered by a dot is based on its diameter and using a few of these could produce all your necessary colors. Like OLED, light and colors could be supplied on demand and QD-LEDs can be very bright. However, current QD displays are based on a blue LED backlight which is then filtered to a white light before passing through the familiar LCD color producing layer. Color gamut is seen as one of OLED’s big advantages over LCD, allowing for more vivid viewing experiences and accurate color reproduction, so long as the media also supports it. LCDs often fall short on color accuracy and gamut because of their reliance on a pseudo-white backlight (this is made from blue LEDs with a yellow phosphor coating). However, the highly accurate nature of Quantum Dots means that developers can use a pure blue back light and accurate red and green filters produce a true white light, which can then be filtered into better looking colors. 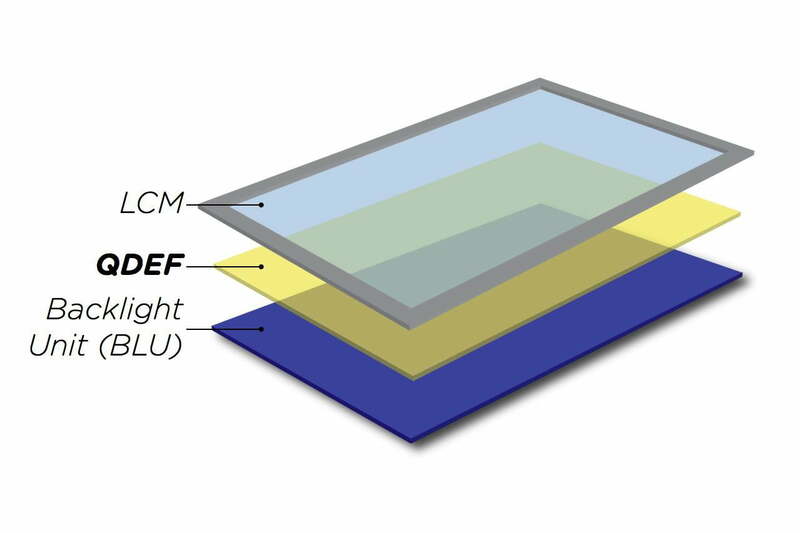 As Quantum Dot displays don’t have to worry about inaccuracies in the white light, there is less compensation required in the LCD filtering layer, so manufacturers can drive up the color brightness and gamut of the display. As a result, QD LED TVs are able to match and sometimes even exceed the color accuracy of OLED panels. However, as QDs are currently reliant on a backlight, the deep black accuracy and contrast ratio will still suffer from similar drawbacks as existing LCD displays. Therefore, OLED should still win out when it comes to contrast and high dynamic range imagery, as it can switch off pixels for a pure black dot, but QD displays will still see a boost in brightness over traditional LCD. This leads us onto viewing angles, an area that OLED again boasts superiority over LCD displays and this is unlikely to change much with the introduction of Quantum Dot displays. Because backlight based displays require a filter layer rather than producing light directly on the surface, some light is blocked when you don’t look at the display from head on. While perhaps not likely to be a major problem on your small mobile phone, Quantum Dot displays won’t match OLED’s viewing angles until designs come along that eliminate the need for a backlight. Perhaps the biggest factor in any technology’s success is its cost, which is one of the reasons why LCD is still so popular in mobile devices. Although costs are falling, high quality OLED displays typically cost around 20 percent more to produce than the same size LCD panels. This is mostly due to the rather tricky production techniques required and lower yields. Fortunately, new manufacturing processes, such as ones based on thermal ink jets, could see prices halve and OLED panel production costs could fall to 20 to 30 percent less than those of LCD by 2017. It’s also worth considering that OLED based products have a shorter lifespan, due to blue pixel materials, and can also suffer from the dreaded “burn in” issue after a while. Quantum Dot displays don’t have from the same problem, as they are very stable over long periods of time. Quantum Dot LCD displays retain many of the benefits of LCD’s lower production costs. The QD filter layer does not add a huge cost or complexity to the production of a display, as it is simply a mixed assortment of red and green dots rather than an intricately laid out matrix. Typically this adds no more than $100 to the cost of a large-size TV, so we are likely looking at less than $10 for a 5-inch smartphone. However these small costs aren’t always accurately reflected in consumer prices and the falling cost of OLED might make QD technology a tough sell in lower cost products, where LCD is currently commonplace. Quantum Dot is certainly a viable rival to OLED, but it is more of an evolution of LCD than a likely successor to OLED panels. Both have their pros and cons, much like display types found on the market today, but Quantum Dot panels close some of the most notable gaps between the two. We are likely to see a number of high-quality Quantum Dot and OLED based devices hit the market in the coming years.